BAMAKO (Reuters) - The United Nations Security Council on Monday called on Mali's government and rebels conclude talks as soon as possible, warning that the failure to do so risked radicalizing fighters and undoing fragile security gains. Members of the Security Council visited Mali over the weekend to assess progress in stabilizing the country, a year after France dispatched thousands of troops to end an occupation of the north by al Qaeda-linked Islamist rebels. The Islamists have been scattered, elections were held and a U.N. peacekeeping mission is rolling out. 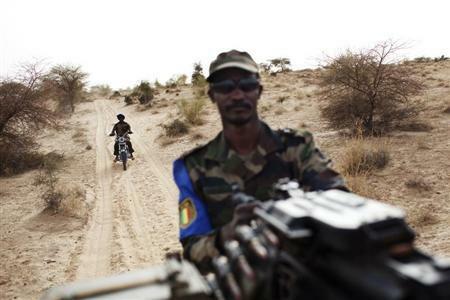 However, talks between Bamako and rebel groups with political demands have stalled. "We urge the parties to engage in inclusive discussions in order to find a sustainable solution without preconditions," members of the Security Council said after the two day visit. "It is imperative to start these discussions as soon as possible and with a clear timetable," their statement added. Two Tuareg and an Arab-led group signed an interim deal last year to allow elections to take place in the summer. Newly-elected Ibrahim Boubacar Keita must now complete talks aimed at ending recurrent rebellions by mainly Tuareg rebels who have called for independence for their desert north. The Security Council said local authorities, armed groups and civil society leaders had said they want talks to go ahead. However, Keita was elected partly for his reputation for taking a firm stand against the rebels during previous uprisings and he is under pressure not to cede to fighters most southern Malians blame for their country's implosion last year. "The absence of an inclusive political framework carries the risk of exploitation by "troublemakers"," the Security Council said, without giving any further details. Gerard Araud, the French U.N. ambassador, added: "If we waste any more time there is a risk of radicalization amongst fighters." A number of Islamist groups linked to al Qaeda hijacked a rebellion launched by independence-seeking Tuareg MNLA rebels in early 2012. The Islamists occupied the desert north for most of the year until they were driven out by French forces after Paris warned the zone had become a springboard for attacks across the region and in the West. Hundreds of Islamists were killed but many also went to ground in the vast north's desert and mountains. Underscoring the lingering threat, French forces killed 11 suspected Islamists and seized large amounts of weapons late last month. A group of 11 aid agencies warned last week that northern Mali faces another serious food crisis, with some 800,000 people in need of immediate assistance. Gunmen and figures linked to organized crime have drifted between the various groups, making it often tricky to differentiate between factions. The rebel groups meant to take part in talks with the government are living in uneasy cohabitation with government and U.N. troops deployed across the north. Burkina Faso has hosted most of the peace talks but Algeria, Mali's neighbor to the north and a key Sahara power broker, said last month it would seek to revive the dialogue by hosting exploratory talks.